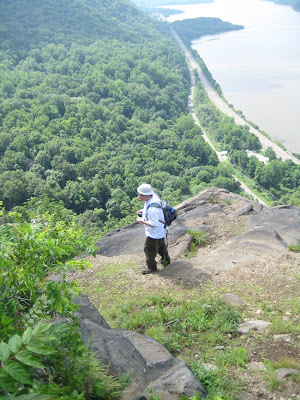 This is one of the greatest hikes in the Hudson Valley region. It’s almost a solid scramble from sea level to the 1200 foot mark. This hike has almost continuous views the entire hike and is a demanding hike. 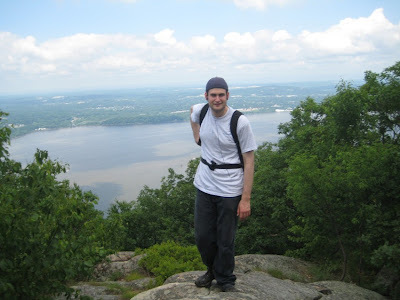 Started hike at trailhead on Route 9D, by the tunnel, and climbed the Breakneck Ridge Trail to all the views and to the summit. Headed down south via the Notch Trail, to the Cornish Estate. The Cornish Estate is an abandoned and overgrown set of houses and farm houses, and you can go in and explore all the ruins. Then continued on the Notch Trail to the Brook Trail, past the cascading stream and waterfalls and over the Catskill aqueduct, back to Route 9D. Took Route 9D through the tunnel underneath the mountain and then back to the car at the trailhead. 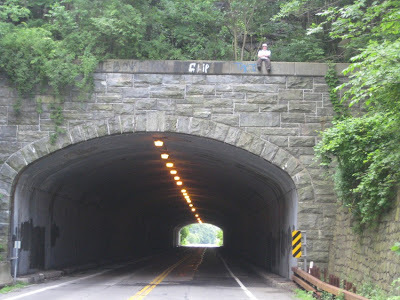 Me on top of the tunnel over Route 9D. The trail goes above the tunnel. Me at the first view. Looking south toward Cold Spring. At the flag at the first viewpoint. Looking south from the first viewpoing. Bull Hill, Rt. 9D, and the Hudson. Storm King Mountain across the river, facing west. Breakneck Ridge and Storm King across the river. Shimmy on the summit. Facing northwest. beforethe tunnel, at the end of the hike. I have been wanting to explore this old iron mine for a while. 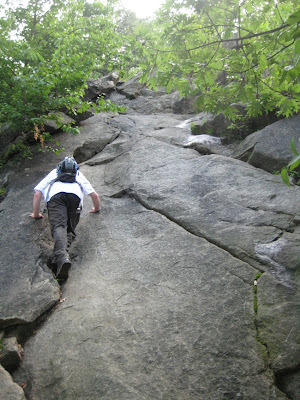 Harriman State Park has many old abandoned iron mines from the civil war era and older, and most of them are off the beaten path, especially this one. The weather was wet and rainy, and this is the coldest and wettest June I can ever remember. There was hardly a day this month that it did not rain. The trails and paths were extremely muddy and slippery, which made this hike rather challenging. Parked at the Anthony Wayne Recreation area off the Palisades Parkway. Normally I don't like parking here in the summer because there is a $6 admission charge, but due to the weather there was nobody at the entrance station. Took the Anthony Wayne Trail northwest across the highway until 7 Lakes Drive, where I veered off to the road that leads to the Cranberry Mine. Off the road is this boarded-up old stone house, which I found quite strange. Started heading up the Cranberry Road path, and I found it to be extremely overgrown and had lost it and ended up bushwacking the direction towards the mine. I actually got stuck in what must be called the "Sand Pit" on the Harriman Trail Map, which is a large overgrown meadow with a swampy bottom. I bushwacked thru this as well and eventually found the road again which lead me to the mine. After finally finding the mine, which has a larger and smaller entrance, I explored the area a bit. Inside the mine is a door that goes into yonder. I was afraid to venture in as I was by myself and lacked a flashlight. After thoroughly exploring the old mine area, bushwacked along the adjacent stream right near the mine down the mountain back towards 7 Lakes Drive, then walked on 7 Lakes Drive back north towards the Anthony Wayne Trail. Along the side of 7 Lakes Drive was the Queensboro Brook, which was extremely bloated and overflowing due to the excessive rains. Took the Anthony Wayne Trail back to the parking area and ended here. Anthony Wayne Trail marker at 7 Lakes Dr. I had gone to Cheesecote Mountain to explore all the unmarked trails there several weeks earlier, but got rained out and had to leave earlier. So I had decided to return on a nice do and more thoroughly go through the trails. Parked on Cheese Cote La. and took the short path to Cheesecote Pond and the Long Path. Then took an unmarked trail north to the summit, where there were great views of Horse Chock Mountain and the Jackie Jones tower. Continued on the unmarked path, not knowing where it would leave me, until it ended at a narrow paved road. This road looked very newly paved and I took it south, and it led me back to the pond where a new parking lot was being constructed there. Apparently they will be developing this park and providing car access. Hiked around the lake and back to the short path to my car, then circled the mountain and found the road that climbs the mountain. This is a very recently paved road and they are now allowing vehicular traffic all the way up to the pond from Willow Grove Road. This new road is very interesting, being very narrow and curvy, and ascending about 400 feet. Looking west from the summit to Horse Chock Mnt. Jackie Jones Mnt with tower from summit. Looking northwest to Willow Grove Rd. Took a short hike with my young daughter up to the lower view of Kakiat Mountain. Took the Mountain Trail up to the Lower viewpoint and took the same way down.